Bacchanalia on the Thames at Oxford. An ideal boat for small groups. A comfortable and elegant alternative to punting and ideal for sightseeing on the lesser traveled reaches of the river. Approaching the Head of the River in central Oxford during a boat trip down the University regatta course. Bacchanalia, our first craft, a beautiful and characterful Edwardian style launch. She is popular for family celebrations and relaxed outings with friends. She is electrically propelled so almost silent running. The perfect venue from which to enjoy a lazy river day. She now has a full length canopy (rather than the half length canopy in these images) and can be fully enclosed if the weather is inclement. She has cushioned bench seating at the bow and Lloyd Loom chairs around a large dining table at the stern. You are welcome to provide your own catering aboard Bacchanalia or you can choose one of our catering packages. 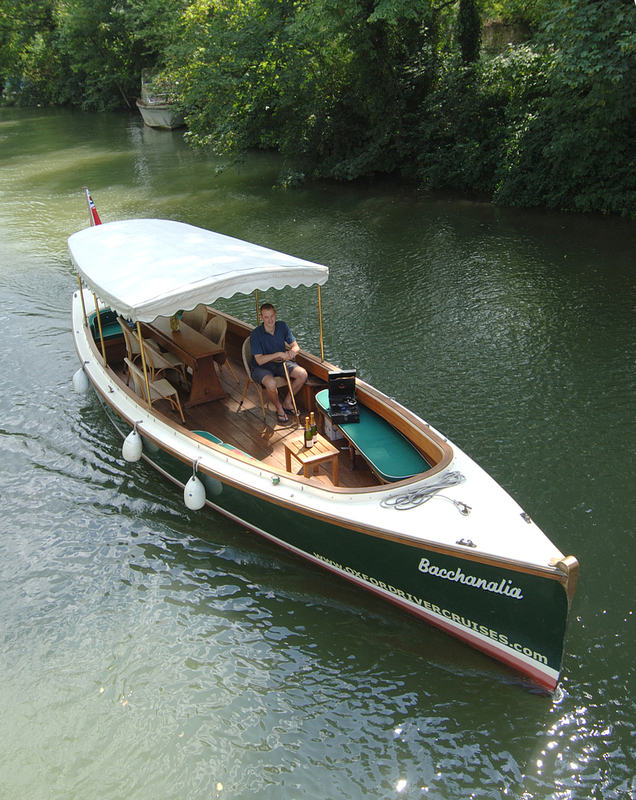 Bacchanalia is licensed to carry 12 passengers (excluding crew and infants). Larger groups of up to 24 passengers might consider hiring Bacchanalia together with her sister vessel Golden Slumbers. The vessels can cruise in tandem and passengers are free to move between them at regular intervals. She is primarily used for private boat hire, group bookings but also operates some of our sightseeing tours and picnic cruises. Aboard Bacchanalia we can provide a variety of picnic style menus for you to enjoy during your cruise. We also offer a lovely afternoon tea which feels like a particular indulgence as you float gracefully down the river.